Get your training started off right! Our goal is to create a dog you can take everywhere with you, and who is happy to listen. Obedience is a communication tool and training should be enjoyable by all. We emphasize your dog's engagement with you, ability to handle distractions, and practical skills for everyday life. All classes, unless otherwise noted, are held at our private training field in Felton. Over 5000 sq ft of turf designed with dog training in mind. This class is designed for puppies and newly adopted adult dogs, aiming to get them off to a great start! We cover basic obedience skills with an emphasis on teaching your dog that obedience is a team effort-so they can make good choices on their own. Life skills such as vet visits, handling tolerance, polite greetings to strangers and dogs are practiced throughout class. Training early on together is important to set up good habits for life! Skills: Sit, down, come when called, go to bed/settle, eye contact, loose leash walking, leave it, stay. Does your dog already know some of the basics, but you want to refine their skills? Need practice around distractions and real life situations? Trouble shooting problem behaviors? Skills: Loose leash walking, settle/stays with distractions, coming when called past distractions. Jump! Weave! ! Run! …and stay, come and walk with me! This agility class will cover the foundation skills needed for agility, as well as practicing impulse control, attention and functional obedience. A great way to exercise your dog's brain and body. This class is appropriate for dogs who have succesfully completed a Manners 1 level course, and comfortable being close to other dogs. Mondays 12:15pm - Practice obedience skills through training games and agility, tailored to the group that week! This is a drop in class - please let me know by Sunday at noon the day before if you’d like to attend (2 dogs minimum to run class) $30/week. No class on 4/22, 4/29, 5/6. Dates: May 27th Mondays 330 pm 6 weeks, $175 (Classes are 50 min and meet once a week. This class will be limted to 4 dog/handler teams. Our overall goal will be to pass the CGC test, and have a great companion who can go out anywhere with you! Skills: Reliable cooperation away from home or under distraction of cues your dog is already familiar with. Building fluency for real life situations. Obedience, cooperation and focus without treats or other rewards visable or in your hand. Incorporating a variety of reward types and values. For fun or competition, training higher level obedience is a great for cooperation in real life, relationship building and as a mental/physical outlet for your dog! We'll begin the training a precision, focused heel (different than loose leash walking) from the ground up, as well as straight fronts, dumbell hold, directionals, and stays. 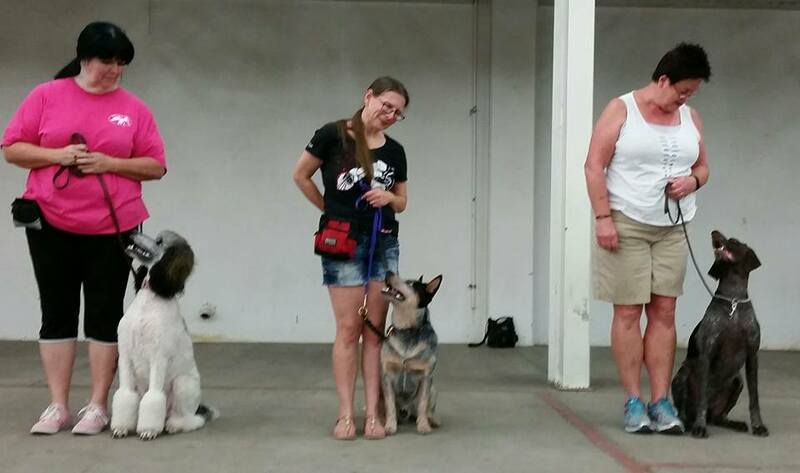 With a good foundation, you'll be able to be successful heeling past distractions in real life, AKC obedience or Rally. Get going with the fun sport of Nosework! We'll teach your dog how to identify particular scents (birch, anise and clove) and find them in a variety of locations. Training using your dog's nose is an incredibly good way to tire out both their brains and body. High energy, nervous, reactive, old or young - all benefit! Nosework games can be played indoors on rainy days, or outside at the park. When your dog is using its 'hunt' drive to find a scent they're working their energy in a directed, contolled way - much better than getting amped up playing fetch. Finding scent is natural for dogs - its telling us where it is that is the hard part! To help with clear communication, we teach a very solid 'alert' behavior first. 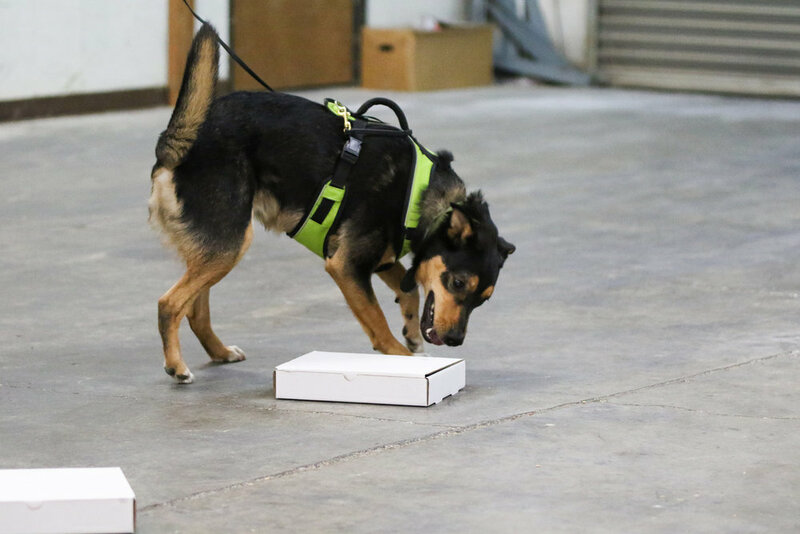 With this method, it is clear to both the handler and dog exactly where the odor source is, our ultimate goal. Beginning: TBD - inquire for next start date! Loose Leash Walking is a challenge for many dog owners, but patience, a sense of humor, and a clear vision of what and how to reward good walking skills will get you where you want to go. Your instructor, Vicki Hinton, is a certified dogBiz Pro Dog Walker. With numerous training games and tips, she'll help you build loose leash walking skills and success.